Have you ever read an event announcement, and when you finished laughing, cleared your schedule so that you could attend? After reading the Quintavian Iron Scribe announcement, several of your trusty EK Gazette editors did just that. IN A WORLD where the perg never dries right and the paint won’t mix properly, one small Shire is out to change the world! Do you feel like the martial activities get all the tournaments? Do you want a challenge and to stretch your scribal muscles? Do you want to be considered a scribal superhero? Do you want to help reduce the back log? Do you have what it takes to prove that you are… the ScribEast*?!? Then we have an event for you! From the Shire that brought you Embroidery Schola, Scribal Schola, Schola in the Shire and many many Royal Progress Events, comes the silliest blockbuster event of the season. IRON SCRIBE! One Scribe, One Scroll, One Day! Unto the populace of the East Kingdom do I, Aurelia Alfaiata d’Alcaçova, send greetings, I have the honor to serve as Gift Coordinator for Their Majesties Wilhelm and Vienna, and I humbly come to you today on Their behalf. The artisans of the East Kingdom are known to be gifted craftspeople and Their Majesties, in Their inestimable wisdom, wish to display the talents of our populace while travelling the glorious lands of our Kingdom and the Known World. In order to proudly showcase our Artisans, the Kingdom relies on your generosity in filling the Royal Gift Chest with pleasing and useful items. At the moment, we need assistance with largesse destined for Baronage holding our noble Eastern lands and for those newly arrived in our Society. In an effort to support Their Majesties in displaying the hospitality and generosity for which the East Kingdom is known, we are also in search of volunteers to help with the gift baskets intended to the Royal Cousins visiting us at Birka, and Royalty welcoming us at the far lands hosting Gulf Wars and Aedult Swim. If needed, below is a list containing suggestions of items that would make wonderful largesse. Please remember that this list is not restrictive and we encourage you to be creative with your works of art. If you would like to donate to the Royal Gift Chest or should you have any questions about largesse, please contact me at aurelia.alfaiata@gmail.com I look forward to hearing from you. Their Majesties are grateful for your generosity in sharing your skills with the East Kingdom. Two pages of the Gresley dance manuscript. Image courtesy the Derbyshire County Council. 1) There will be an online A&S rubric workshop THIS THURSDAY at 7:30. —Bjorn’s Ceilidh/Baronial Investiture (Concordia) 1:30-3:00, downstairs in the dayboard hall. 3) Finally, as a reminder: There will also be an online East Kingdom A&S Office Town Hall on Thursday Nov. 1, from 7-8. The web link will be announced the week of the meeting. Thank you and please share where appropriate. —–Thanks to Master Magnus and Mistress Elena for helping to run the rubric workshops and to Master Mael Eoin for technical assistance setting up online workshop. These tables are intended to provide feedback and/or mock scoring to artisans regarding current (or proposed) projects. Our goal as consultants is to provide guidance which will be useful to those engaging in in A&S activities and to those who are considering entering future A&S competitions. Attendees at these training sessions will discuss the purpose behind the rubric, review and familiarize themselves with rubric itself, and then practice as a group using the rubric to assess an example A&S project. While these sessions are being organized primarily to train judges for K&Q A&S, this class can also greatly benefits artisans. All are welcome to attend! If you can’t stay the entire time, please stay as long as you can. The Society Minister of Arts and Science, Seigneur Etienne Le Mons d’Anjou, and the Society Deputy Minister for the Sciences, Master Galen of Ockham, are soliciting for bids for a Known World Sciences Symposium to be held in calendar year 2020, though a bid for a 2019 date would also be acceptable. What do you mean by “Sciences”? The Arts and Sciences in the SCA are most commonly represented by making a period-style object – clothing, armour, scroll, brooch, etc. The Sciences, on the other hand, deal more with observations and interactions with the natural world and the underlying theories – thus the term ‘natural philosophy’ that characterized the early forays into our modern sciences. Some examples include: astronomical instruments, their theory and use; the Aristotelian system of physics; cosmological theories; astrological medicine; food as a treatment for disease; theories of disease transmission; agricultural production; care of battlefield wounds; beekeeping; a medieval bestiary; alchemical theories; Scholastic philosophy; metallurgy; medieval dyes; the origin and development of university education; medieval music theory; and many, many more. What are the considerations for the event? EKCoP Invites all experience levels to an online class! ≈ Comments Off on EKCoP Invites all experience levels to an online class! Description: How do you convey your persona while telling a story, singing a song or declaiming a poem? Take this class and find out how to insert even small smidgens of your SCA persona into your performance! Fill out this form to join EKCoP’s mailing list! Join us on Facebook! A great way to find performing and bardic opportunities and meet other performers! East Kingdom College of Performers (EKCoP) Mailing List Sign up! 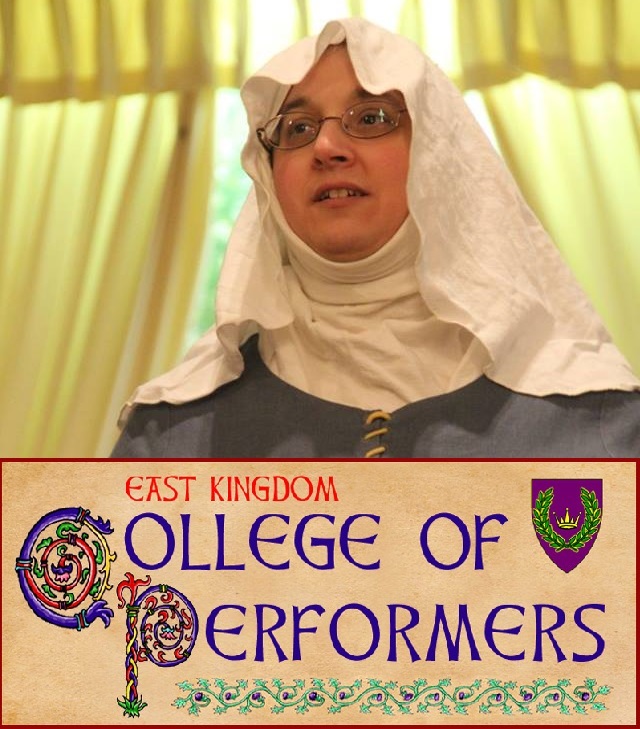 ≈ Comments Off on East Kingdom College of Performers (EKCoP) Mailing List Sign up! East Kingdom College of Performers (EKCoP) is having a membership drive before our October elections! EKCoP welcomes everyone, performers and interested audience members alike! Fill out the survey below to join our mailing list and keep up to date on our schedule of online classes and virtual open performing arts and bardic practices as well as the latest performing arts news in the East Kingdom. EKCoP welcomes all performers of all skill levels! We have musicians, poets, bards, storytellers, singers, Commedia dell’Arte, slight of hand, belly dancers, contortionists, improvisation aficionados, those not ready to perform in front of an audience, interested audience members and more! Fill out this form to join the mailing list! For the past few years, the Arts and Sciences war point at Pennsic has been based on populace choice. However, this year, the war point was a judged competition. Led by the A&S war point general, Raziya Bint Rusa and her lieutenant, Agatha Wanderer, the East worked with artisans from other kingdoms to develop a rubric and competition format for the day. Artisans were invited to apply for a spot on the team, and judges were recruited. The war point took place on Thursday August 9th 2018, in the Great Hall, the event lasting from 8:30 until 4pm. The East was ultimately victorious, winning 4 out of 5 possible war points! During his address to the entrants, King Brennan noted that according to his tally, A&S had actually won the war for the East at that point, a statement that was met with much rejoicing. The East won two points for the highest overall combined score, beating the Mid by only 5 points (East and Allies 393, Middle and Allies 388). Such a close score speaks to the quality of all the artisans who entered their work into the competition. The East also won in two out of three categories, for an additional war point each. Lada Monguligin won the domestic, archaeology, and lived objects category, and Gnaea Celera won the arts and studio crafts categories. Alternate Entrant – Ibrahim al-Rashid – Socks from post Roman Egypt: Comparing and Contrasting structures. Baroness Jeanne’s original designs for the wallhangings. Two magnificent wallhangings will be displayed at our 50 Year Celebration event. The project was the idea of Baroness Jeanne de Robin of l’Île du Dragon Dormant. Each wallhanging shows the arms of the King or the Queen surrounded by the personal arms of our first 100 Kings and 100 Queens. The Royal Line begins at the top left of each wallhanging and proceeds clockwise in a spiral. The overall size of each panel is 54” by 60”, and the personal devices are each 2” wide by 2.4” tall. The individual motifs and the entire backgrounds are embroidered in convent stitch, a self-couching technique, using silk for the small elements and wool for the larger ones. When you view the wallhangings in person, look closely for the details you can’t see from a distance. The Kings’ panel will be displayed in its nearly complete state. The Queens’ panel still has more work to be done, and Baroness Jeanne encourages everyone to put in some time on it, whatever their experience level – she would be happy to teach the stitch to all who are interested in trying it. In the course of designing the wallhangings, Baroness Jeanne collected the personal arms of our Royalty, and has made her list available for reference here. 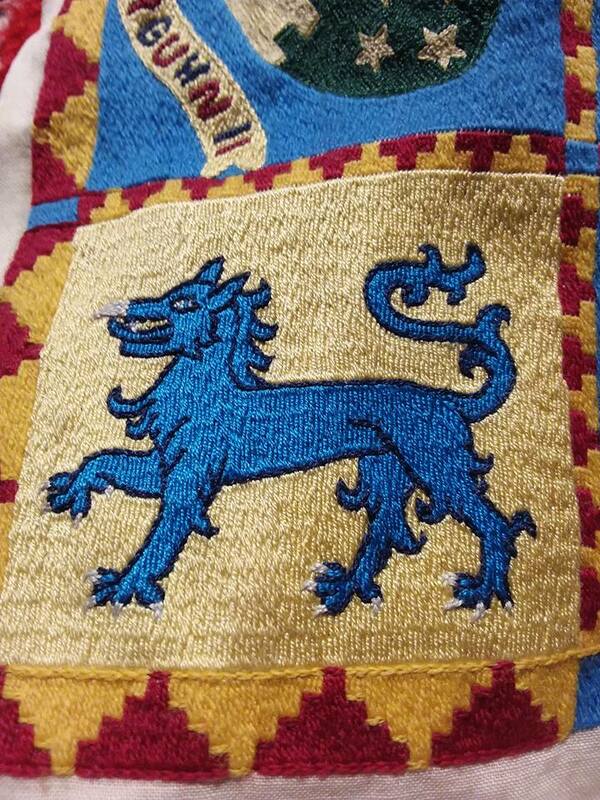 Some arms stitched by Baroness Jeanne, shown at the Athena’s Thimble meeting at Pennsic 2011. Q: When did you come up with the idea for this project, and when did the work actually start? A: The project started in April 2010, with the arms of Countess Alethea, but the concept was very nebulous. The genesis of the project was I wanted something small to embroider during my commute to work, but that was part of a larger project, so that I wouldn’t need to think up something different every 2-3 weeks. It wasn’t until 2011 that I sat down and actually planned out the wallhangings and realized how big a project I had embarked upon. Q: Did you originally plan to do all the work by yourself, or did you always intend to involve other stitchers? A: In mid 2011 when I properly planned out the project, I had 9 alternate plans. Plan E was to involve other stitchers if the wallhangings hadn’t progressed sufficiently. In October 2016 I opened the Queens’ wallhanging to other collaborators. An Eastern Tyger, stitched by Baroness Jeanne, to fill the corner of a border. Q: How many different people have worked on it? Q: Do you have any idea of the number of hours invested into this project? How about an average time to complete one device? A: I made a conscious choice at the beginning not to count hours, though it’s in the thousands. The individual arms vary considerably, depending on complexity, but I would say 12-15 hours is a good average. Q: How many devices were lost and had to be replaced? A: Ouch. Old wounds. 17 devices were lost at Panteria. I lost one of Brion on the bus last year, and I either miscounted or misplaced a Gregor. There were also a few kits that went out and were lost track of (or lost by USPS). Q: How many Royals do not have registered heraldry? A: Twelve, though several of them use a device that is not registered, and several others use something other than their registered heraldry. 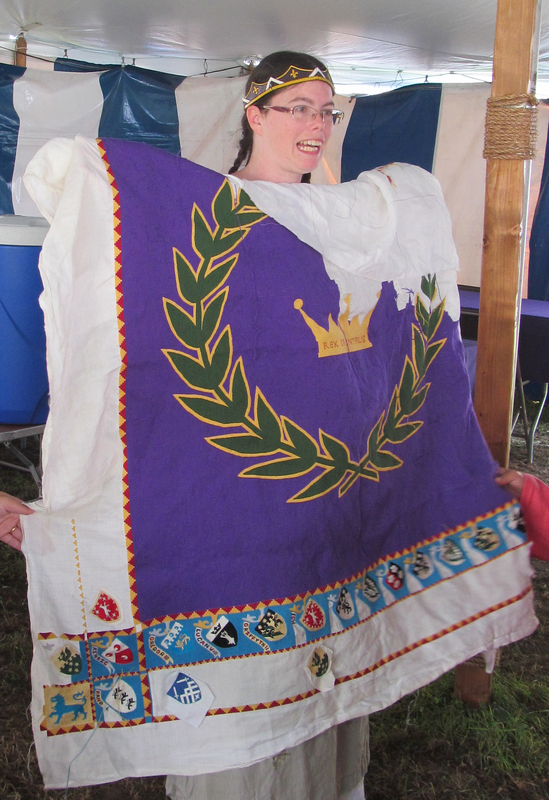 Baroness Jeanne displays the Kings’ wallhanging during Pennsic 2017. Q: How much linen and silk and wool have been used to make the two wallhangings? A: A lot? I bought the thread on 1/2 lb spools, with 1lb for the purple wool. There is about 1/4 a pound left on the purple, and a fair amount of the Queen’s left to stitch. Q: Have you paid for all the materials yourself? A: Yes. A few tax returns went into the purchase. Q: How do you hope the wallhangings will be used after the 50-year celebration? A: I’m hoping the Royals will travel with them and continue to display them. Q: What have been the biggest challenges of this project? 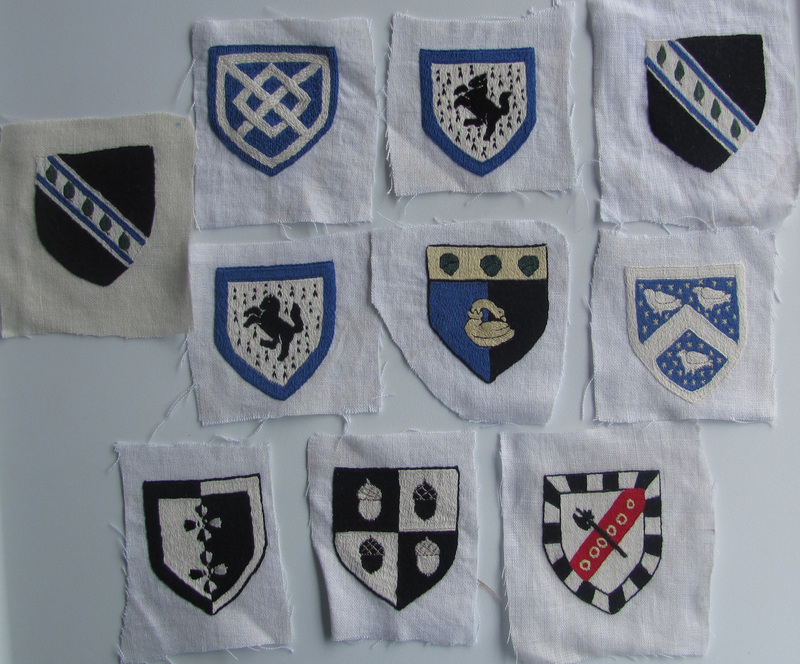 A: The biggest challenge was tracking down the heraldry. My goal was “the arms as used at Crown Tourney”. Many of our Dukes registered their arms years (decades) after their reign. Some registered as close a variant as was legal, but continued to use their original device, others changed devices over the years, sometimes multiple times. The Laurel Archivist was very helpful in tracking down the original submissions, but the artwork on some of the submissions from the 60s and 70s look like they were drawn by me. Q: What stories can you share? A: My regret was I didn’t write down the stories that were shared with me, and several of those people have since passed on. Unfortunately the ones that have stuck in my memory are not suitable for public consumption. 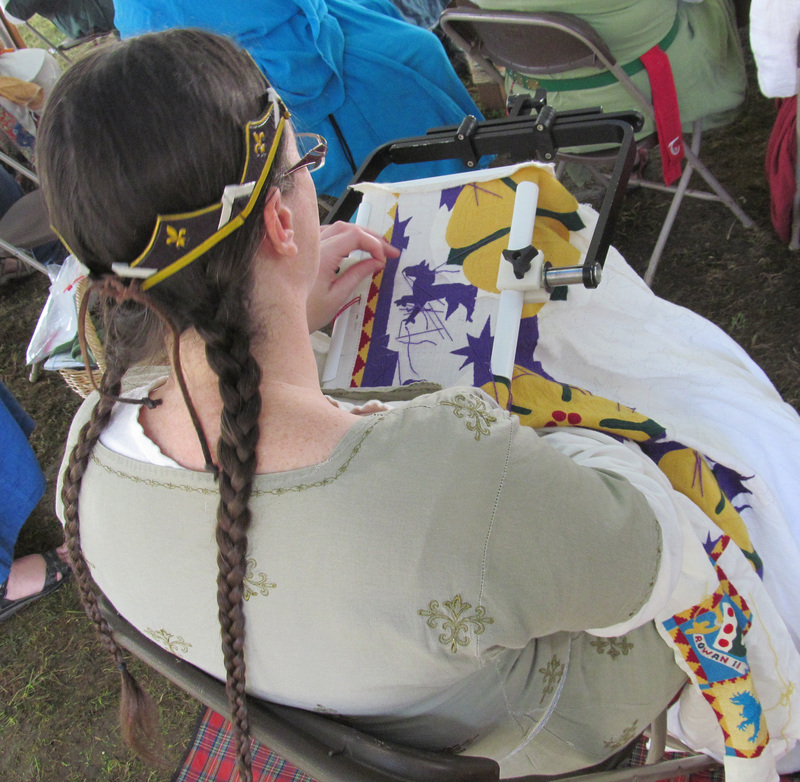 Baroness Jeanne at work on the Queens’ wallhanging during Pennsic 2017. Q: What advice would you give someone who might create something similar in another 50 years? A: Advice? I could probably fill another entire article with advice! Get help. Even if it’s a solo project, get someone to bounce ideas off of, keep you on track, cheer you on. Invest in high quality materials and tools. If you can’t afford them, hold a fundraiser. Cheap materials can detract from the final product, no matter how skillfully executed. Cheap tools add time and frustration to a project. Ask for bulk discounts; if you don’t have the volume required, see if others will go in with you and split the cost. Avoid a hard deadline if possible. Set soft targets/ milestones and celebrate the achievements. Modularize the design into parts that can be worked independently, even if you’re working alone. Take progress photos. Document your design decisions. Use a tracking tool. It could be a project journal, or a spreadsheet, or a to-do list. If it’s a group project, designate a project coordinator, they don’t have to be the chief designer, just someone organized who can keep track of all the various parts. Publicize the project, repeatedly, through multiple channels. Create an online discussion group, preferably one that can host pictures. If workers are geographically dispersed, designate regional deputies. Solicit feedback and progress photos early for take home work. Check in regularly with workers. Keep track of who contributed to the project. Reporting by Lady Phaedra and Mistress Ygraine from the Gazette staff. Designs and Tyger photo by Baroness Jeanne de Robin. Other photos by Mistress Ygraine of Kellswood.